How are Garmin's products for trip planning? About a week or so ago GoneNomad and I began a discussion in Private Messaging regarding how a Garmin standalone personal navigation device (PND) might handle some of the routes he has been using to test the many other products we have been looking at recently (Here, Bing Maps, Google Maps, Windows Maps, and others) in discussions in the Software, ALK, and Microsoft sections. Garmin also has PC products that are free and can be used for waypoint management, route and trip planning, and loading the results onto their devices. It seemed relevant to place some of our discussion into a thread in the Garmin section for reference. Unfortunately our discussion had already spread across at least three different threads in our Private Messaging by the time I realized some of it should be public. So, here, with help from our esteemed host and owner of Laptop GPS World, Marvin Hlavac, I've tried my best to put the most relevant posts from those private discussions into a single, hopefully coherent, thread. Since you have a Garmin PND, if you wanted to test this route on it, I would appreciate it. I covered all the other bases (except for MapQuest), but don't have a Garmin. I posted my findings about Here's erratic routing on longer trips on a POI Factory (Garmin-centric) comments thread, but although there are lots of unsubstantiated opinions there, only one poster actually took up my challenge to plot this on Garmin, and I'm not sure if here replaced the first end with either of the alternates (he may have just ADDED Nashville and/or Miami, which defeats the purpose). Okay, here are the results so far. To begin with, Garmin has two free PC programs that can be used for managing waypoints, routes, and tracks, and also for planning (creating routes, searching POIs, etc.). Basecamp is their current one and it is constantly being enhanced with new features. Mapsource is their older, discontinued product. It's still available for download and many of us still prefer it for basic features because of its simplicity (hurray for old stuff that still works). In the spirit of our collective quest to see what works today for planning I figured I would start with the PC programs and then see how a Garmin personal navigation device (PND) did it in comparison. I should clarify that Basecamp has two route planning features built in. One is the Route tool that works the same as the similar tool in Mapsource (and many of the other tools you've looked at). As it's name says, it's strictly for calculating a route between two points. It also allows you to insert as many "stops" as you wish. It doesn't really treat them as stops but rather as "via" points that allow you to force the route to go where you want in the event the default route does not. The Trip Planner is what it's name says. It allows you to define how many driving hours in a day and other things that are relevant to multi-day trips. You still specify a starting location and a destination and can insert as many stops as you wish. But it will use the driving hours and other trip-related constraints you have defined to try to get your real (overnight) stops to be the destination for a particular day. Then it will calculate an overall route that is really the connection of a number of "day" trips. First I did a Route in Basecamp and Mapsource using the Route tool to go from Imperial, MO, to the Whitehaven Welcome Center in Paducah, KY. They look pretty much identical. I then used the Trip Planner function in Basecamp and the route it created also looks the same. I've attached screenshots of the three results below. I then did a route on my Nuvi 765T. That was a learning experience because I've never done a route in it that didn't start at my current position! But I discovered that it can do that ("Custom Routes"). I'm not sure if any of my other PNDs can do that. Much like Streets&Trips, there is value in hanging onto the old technology (this my oldest one). In any case, the resulting route was identical to the routes calculated by Basecamp and Mapsource, as nearly as I could tell. I'm not sure how to get a screenshot off the Nuvi so you'll have to take my word for it. The maps on all examples were the same ones: Garmin City Navigator North America 2017.3. Is there a point in doing the other two addresses in Nashville and Palm Beach? I don't mind but curious minds... you know? In any case, the resulting route was identical to the routes calculated by the Route tool in Basecamp and Mapsource, as nearly as I could tell. Is there a point in doing the other two addresses? I don't mind but curious minds... you know? re: "I'm not sure I actually understand the point of the multiple end points." 'On the longer routes (to Nashville or Miami), Here, Bing & TomTom all plot entirely different routes. The point is, if you plot a route to a destination (in this case Whitehaven Welcome Ctr) that's exactly on the way to a farther away destination, the first part of a route that goes only to that farther-away destination (in this case Nashville or Miami) with no intermediate stops should not be totally different than it was to begin with. Okay, here are the results so far. I did a Route in Basecamp and Mapsource. They look pretty much identical. I also used the Trip Planner function in Basecamp and the route it created was quite different from the one the Route tool created in both Basecamp and Mapsource. OK, I guess I don't understand WHY "the Trip Planner function" in Basecamp creates a different route than the Route tool in Basecamp. But unless it's intended to be an alternate routing (like GoogleMaps & all the others do) or unless there can be different user-set routing parameters for one vs. the other, then it is what it is, and I don't think I like that inconsistency. OK, I guess I don't understand WHY "the Trip Planner function" in Basecamp creates a different route than the Route tool in Basecamp. I do. It was purely operator error!! I have the default routing profile in Basecamp set to Motorcycle with additional options that, in a nutshell, cause it to take the more "interesting" route than the standard Driving profile. I caught that when I did the route using the Route tool. What I didn't catch is that the Trip Planner does not inherit the change on the main screen (I did not change the default profile in Preferences, just the current routing profile). So the first trip I did with the planner still used the Motorcycle profile without my noticing. I've gone back and redone all three routes in Basecamp and Mapsource Route tools and Basecamp Trip Planner. Now there are screenshots attached for Basecamp's Route tool with the Car profile, and also with the Motorcycle profile for each of the three routes to illustrate the differences. Then I did the Trip Planner routes using the Car profile. It's the same as the Car profile in the Route tool. The Mapsource routes are also the same as the Car profile in Basecamp. The Nuvi doesn't have any profiles on it to worry about so all three come out looking like the Basecamp Car profile with the Routing tool, as near as I can tell on the 4" screen. I hope that's what you were looking for. Holler if you need anything more. 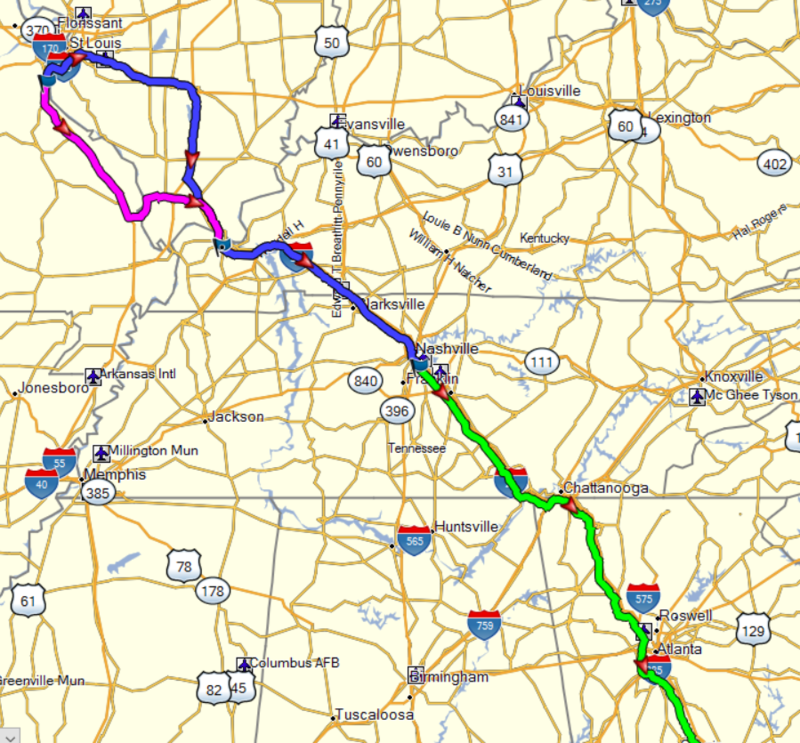 Looks like some of the screencaps of the longer routes show blue flags in the middle, for instance at Paducah. If those blue flags are waypoints, that locked the longer route down to going via that point (as in "via point"). But if I'm interpreting these correctly, it looks #4 doesn't have a waypoint in Paducah, while #5 does, and only #5 maintained the same route from Imperial to Paducah as screencaps #1 & #2. If that's correct, then Garmin's routing isn't stable either... the first segment changed just due to extending the route to a farther-away destination (if there are no manually-defined waypoints in between start and end to force the routing to stay the same.). Don't sweat the blue flags. To make my life simpler I just created waypoints out of each of the addresses when I looked them up so I didn't have to do a search every time I tried a route or a trip. So they'll show up on the map no matter what. The fact that a route happens to go somewhere near one or more of them will be coincidental. I did the same thing in Mapsource so they'll show up there, too. If you're seeing one route to the same destination going near a flag that shouldn't be involved and another route to the same destination not going near that same flag, make sure they aren't using different profiles (car vs bike) before you make a judgement. If you are concerned about any specific route please specify the start and end address you want me to check, and which program (Basecamp or Mapsource), and which tool (Routing tool vs Trip Planner). And which profile (car vs motorcycle) if it's the Basecamp Route tool. Don't just specify a screenshot number just in case I don't count them the same as you. ...Using the same method you used for the very first two screencaps. "mapsource route 1200 main st to 1845 lone oak.PNG"
"basecamp route 1200 main st to 1845 lone oak.PNG"
I'm not sure I understand. Are you saying that the route to the Nashville address SHOULD go through the Whitehaven Welcome Center waypoint? Even if that waypoint is not included in the route? No, not that it should go through the Whitehaven Welcome Center Even if that waypoint is not included in the route. The Whitehaven Welcome Center was chosen because it is as close as possible to the interstate highway that continues on to the subsequent destinations. This is an extreme closeup of this part of the google default route. The first ~155 miles of a "good route" to all three destinations should be the same. Of those I tested, on the longer routes (to Nashville or Miami), Here, Bing & TomTom all plot entirely different routes. Only Streets & Trips 2013 and Google Maps don't do this. And now I think I've figured a better way to express this. If the first ~ 155 miles of all three aren't the exact same route, the routing algorithm has problems with longer routes. I'm still not entirely sure about Garmin. This is an extreme closeup of this part of the google default route. Notice that the Whitehaven Welcome Center is literally on the ramp used to get onto I-24 E (southbound here). I don't know of a place with an address that's much closer to I-24 than that. It doesn't matter. It could as easily be a waypoint planted in the middle of I-24. The point is you've determined that the optimal route in your two longer examples follows I-24 at that point. A waypoint in that vicinity is merely a handy visual reference. Correct, but I was staying with something that had a street address to avoid having to use coordinates, and I was also using the Whitehaven Welcome Center for other testing, including whether or not a routing algorithm would find the correct exit (only Bing did that unless I "helped" by providing those coordinates to the parking lot instead the building itself). Aren't you glad I know where some of these troublesome routes are? BTW, S&T2013's routing seems to be better than is was several versions back, working off of recollection. Part of that is new roads, but that's not the entire improvement. For example, Highway 2 east of Lincoln, NE was always there, and S&T2009(?) didn't get that one right on the St.Louis-to-Cheynne, WY route. The common thread in most of my tests is for the algo to correctly "guess" when a shortcut on a non-limited-access highway is worth the distance savings. It's definitely worth it east of Linclon, NE (compared to going interstate-only all the way north to Omaha and back) So far, google has gotten that correct in that test, and every other every test. But Bing isn't too bad either, and I like some aspects of its UI better than GoogleMaps. In comparison, Here has done so poorly in my recent tests that it doesn't matter what else it does right. Here's long-distance routing cannot be trusted. Was that intentional??? You've just introduced Yet Another Parameter. Most routing algorithms default to Shortest Time, not Shortest Distance. Garmin's definitely do. If you want me to test for Shortest Distance you have to specify that. All the stuff I've done so far was left at the defaults for the Driving (Car) routing profile which defaults to Shortest Time. Clearly it gets the shortest time from limited access roads. This does make a difference for longer trips, as i suspected. Check out the screenshot named "3 routes no via points.png" (attached below). That one was done with the default routing profile on all three routes. When Basecamp looks at the map data and does the calculations using, among other things, the speed limits on the available limited access highways, it obviously calculates that using freeways as much of the time as possible creates the quickest route for the two longer routes. So, as you can see from the three different colored routes in that shot, the one to the Welcome Center continues to follow the route in my earlier shots but the two longer routes immediately head off to get onto the fastest freeways as soon as they can. The calculations would appear to say that the cumulative effect of that decision is quicker, overall, than for the shorter route. I can, however, force it to route over the Welcome Center route for the first portion of both longer trips (see "3 routes with I-24 waypoint.png") with one simple addition. I created a waypoint in the southbound lane of I-24 immediately before (north of) the crossover of I-45. That's it. With that waypoint inserted into the two longer routes they recalculate to follow the same path as the Welcome Center route. I know this makes Basecamp's routing look inconsistent. But based on what I know of routing I would have to know the speed limits, and any other relevant restrictions, contained in the database for the freeways involved in the northwestern portion of those routes to understand why it's selecting different routes for the shorter versus the longer. I hope that's what you were looking for. That's exactly what I did in "3 routes no via points.png". I tried to explain that when I referred you to it in my previous post. Sorry I didn't clarify exactly which routes were which. I thought the three different colors combined with my description would make it clear. Which first leg does the (green) route to Miami take? My guess is, it commits the same error as the (blue) route to Nashville. 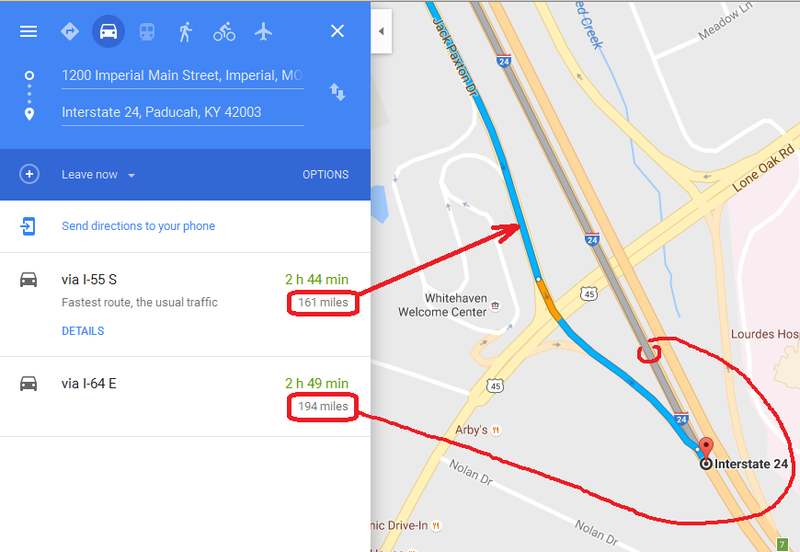 BOTH of those routes from Imperial to Paducah cannot be the "right" one for a given set of parameters. There is NO reason for it to change just because the trip extends further. ...This does make a difference for longer trips, as i suspected. Check out the screenshot named "3 routes no via points.png". That one was done with the default routing profile on all three routes. ..When Basecamp looks at the map data and does the calculations using, among other things, the speed limits on the available limited access highways, it obviously calculates that using freeways as much of the time as possible creates the quickest route for the two longer routes. Two different routes to the same point (I24 next to Whitehaven Welcome Center) can't both be faster or shorter. ..So, as you can see from the three different colored routes in that shot, the one to the Welcome Center continues to follow the route in my earlier shots but the two longer routes immediately head off to get onto the fastest freeways as soon as they can. The calculations would appear to say that the cumulative effect of that decision is quicker, overall, than for the shorter route. I think Garmin's (or other PND) route calculations, being optimized to not take too long on a relatively slow CPU in a PND, become less "fine" (more coarse) on longer routes. Google's server-based approach doesn't suffer that limitation (in practical terms).